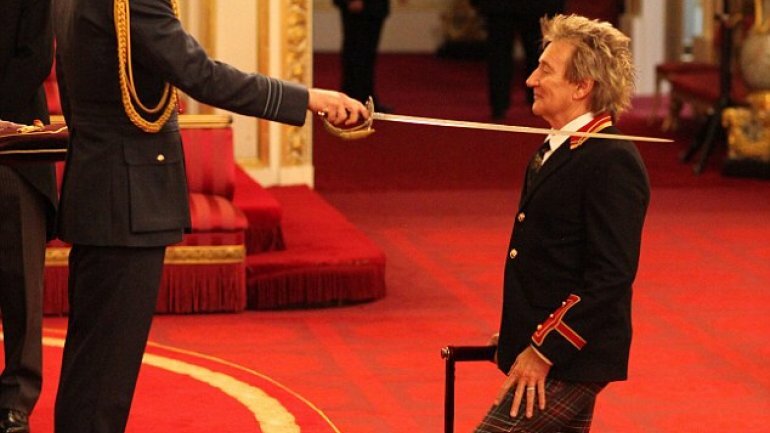 Rod Stewart was joined by model wife Penny Lancaster and their two children on Tuesday afternoon as he received a Knighthood in recognition of his services to music and charity, reports Daily Mail. The veteran rocker, 71, was bestowed the honor by Prince William at Buckingham Palace following a decades spanning career that began in the early '60s with little known rhythm and blues group The Dimensions. Arriving on the arm of his statuesque wife and joined by sons Alistair, 10, and five-year old Aiden, Rod was in characteristically high spirits as he prepared to accept his award. The singer, who was born in affluent North London suburb Highgate to a Scottish father and English mother, acknowledged his Celtic heritage by sporting a pair of colorful Tartan trousers for his meeting with Prince William. The rocker later said he wished his parents were there to see him receive a Knighthood, as the Duke of Cambridge congratulated him at Buckingham Palace. Reflecting on his meeting with the Prince, he said: 'We talked about music and he said "It's great that you're still going" and I said: 'I have to - I've got eight children! Sir Rod will meet the Queen later at a reception at the Royal Academy of Arts - her first public engagement in London since returning to Buckingham Palace after spending the summer at her Scottish residence. Rod previously described the award as a "monumental honor".